We will set the stage for the Fellowship and start getting to know each other; we’ll explore team communication, program expectations, and take a tour of the Tenderloin, our neighborhood. Location: Center for New Music, 55 Taylor St, SF, CA 94102. ChE (pronouns: they/ them/ their) is a Queer Afro-Indigenous artivist bringing ancestral healing into the intersections of youth leadership development, liberatory consulting, and socially engaged artmaking. ChE is the recipient of the University of California Irwin Award for artistic excellence, graduating with honors from UC Santa Cruz with a bachelor’s degree in Psychology and Art. They have received mentorship from notable masters in their field, including Dr. E.G. Crichton in Intermedia/ Installation, Vivien Bassouamina in Traditional Congolese Dance, Byb Chanel Bibene in Contemporary Congolese Dance, and Claudine Naganuma in Modern Dance and Corvino Ballet Technique. They have been a principal dancer in Kiandanda Dance Theater and dNaga Dance Company. ChE is an awardee of the Southern University of New Orleans’ 2016 Social Innovation Certification for Artists at M.A. Museum Studies Program. In 2013 ChE launched Breathe-In Liberation, an incubator for Queer and Trans* activists-of-color to practice embodied leadership. Through this platform, ChE partnered with the Living Room Project, Impact Hub Oakland/Omi Gallery, and Black Folks House to offer a free day of healing throughout East, West, and downtown Oakland, CA for the 2014 National Day of Healing Justice for Black Lives. Wellness resources by and for people-of-color included yoga, reiki, somatic body work, acupressure, Afro-Indigenous ritual, meditation, and sound healing. In 2014 ChE partnered with Destiny Arts Center and founded the Art Liberation Troupe, a QTPOC youth performance group utilizing Afro-Indigenous storytelling circles, street theatre, and youth-led arts activism workshops as tools for social change. ChE has worked with organizations throughout the Bay Area including Destiny Arts Center, Healthy Initiatives for Youth, BAYC Our Space, Montclair Dance Athletics, Alameda Head Start, and Impact Hub Oakland utilizing their Afro-Indigenous model for race and gender justice. 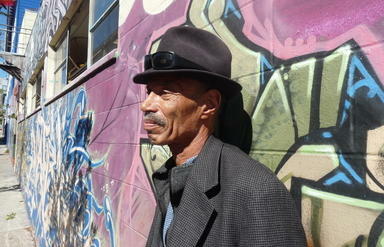 DEL SEYMOUR has spent many years on the very streets where he now conducts the tours. An Army Veteran, Del went back to his home in Chicago in 1969 and immediately left for California. In his time in San Francisco, he has seen the area from all angles: as an addict living on the streets, as a taxi driver, as a husband (for only fifteen minutes–his self-described “Hollywood marriage”), as a volunteer at one of the many service organizations. His idea for Tenderloin Walking Tours stems from his love of the neighborhood. He works in conjunction with many of the social agencies in the Tenderloin (he serves on the Board of The Gubbio Project among others) and also the companies that have moved into the Market Street corridor and has received the respect of everyone he involves. His knowledge and communication skills make him an ideal ‘docent’ for the area.